Last weekend, Dixie and I left the kids at home with a friend and made the journey down to St. Paul, Minnesota to attend a taping of A Prairie Home Companion (APHC) with Garrison Keillor. Never heard of it? It doesn’t surprise me. Most people I know haven’t heard of it. APHC is an old-time radio variety show. Garrison Keillor began the program in 1974. With some changes and a short hiatus, it has been going for 37 years. It combines music (often with famous musical guests), comedy-dramas, and humourous stories and monologues. Imagine CBC’s Vinyl Cafe, but more old-timey, twice as long, and much better (I like to think Stuart McLean is inspired by Keillor’s show). We showed a friend some video clips of the show, and she said, flatly, “That’s what you drove eight hours to see? Well, good for you guys.” Obviously, she didn’t see the value. Another said, after I told him about the trip, “That sounds like something parents would do.” I’m okay with that. There are times when I’m an old man at heart. I first heard of Garrison Keillor in high school. Our art teacher would play his “News from Lake Wobegon” monologues while we painted and made pottery. Lake Wobegon is a fictional Minnesota created by Keillor (he has written books based on these stories). It is mostly populated with Norwegian Lutherans (although there is a Catholic Church–“Our Lady of Perpetual Responsibility”). His stories follow the everyday adventures of the townspeople. I fell in love with these stories immediately. Dixie also grew up listening to “The News from Lake Wobegon”. I copied her parents cassettes of the stories and we spent hours listening to them on road trips. Later I bought all the CDs. It wasn’t until years later that I discovered APHC the radio show in which the Lake Wobegon stories are told. It has been playing on National Public Radio since 1974. I started listening to archived shows available on their website. Then the film, starring Kevin Kline and Meryl Streep, was released in 2006. It’s fictionalized account of the program, it’s quite an accurate in its representation, except that some of the characters on the real-life radio show were made into real people in the film version. Dixie and I both love the film. Since we moved out here two years ago, we have been talking about going down to St. Paul to catch a taping before the show goes off the air. We would never be this close again, as far as we knew. So when the opportunity arose, we jumped on it. We also happened to discover that Garrison Keillor has announced his retirement in 2013. The show wouldn’t be the same without him; I imagine his retirement will mean the end of the show as well. After my Friday afternoon class, Dixie and I hopped into the van and headed south. We live only about 45 minutes from the American border. Border guards are not friendly folk, are they? I think they’re paid to be cranky. I thought maybe she was angry with me for interrupting her smoke break. She didn’t crack a smile. We soon discovered that speed limits on U.S. secondary highways aren’t the same as on the Canadian equivalent. We had planned to take the 59, which runs south from Winnipeg, about 2 miles east of Otterburne. The 59 would take us to Detroit Lakes, MN, where we would head east on the U.S. 10. We didn’t like the idea of driving 90kph the whole way when we are used to driving 112kph (based on the functional Canadian speed limits). We filled up with gas just south of the border. The attendants told us we could drive 20mph (30kph) faster if we took the interstate, which was 30 kms west of us. And that’s exactly what we did. Better psychologically, but probably didn’t save us any time. We arrived at our hotel at about 10:30pm and went straight to bed. The next morning walked a couple of blocks to Mickey’s Dining Car. 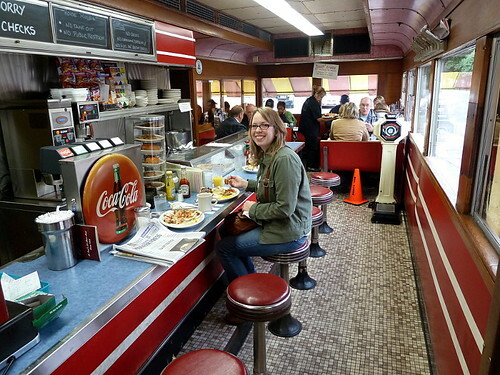 It’s a 24 hour/365 day diner that’s been in operation since 1937. 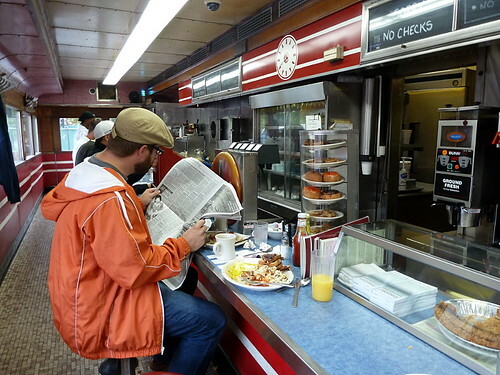 It’s really a greasy spoon–not very clean, but quaint. It’s on the U.S. National Register of Historic Places. Breakfast was delicious. I’ve always wanted to eat at the counter in a diner. There was a lady with a small child there when we arrived. The child was wandering around and the mother said, “Go back to the seat. You shouldn’t be ‘wacking’ around the aisles.” A true Minnesotan woman, I guess. In the background behind Dixie (to her left) is the booth where Meryl Streep sat with the other cast members in the film. Afterwards we drove out to the Mall of America. It’s apparently bigger than the West Edmonton Mall, but once inside it really didn’t feel that way. It was quite tastefully arranged, actually. I rarely felt like I was in a massive temple to consumerism . 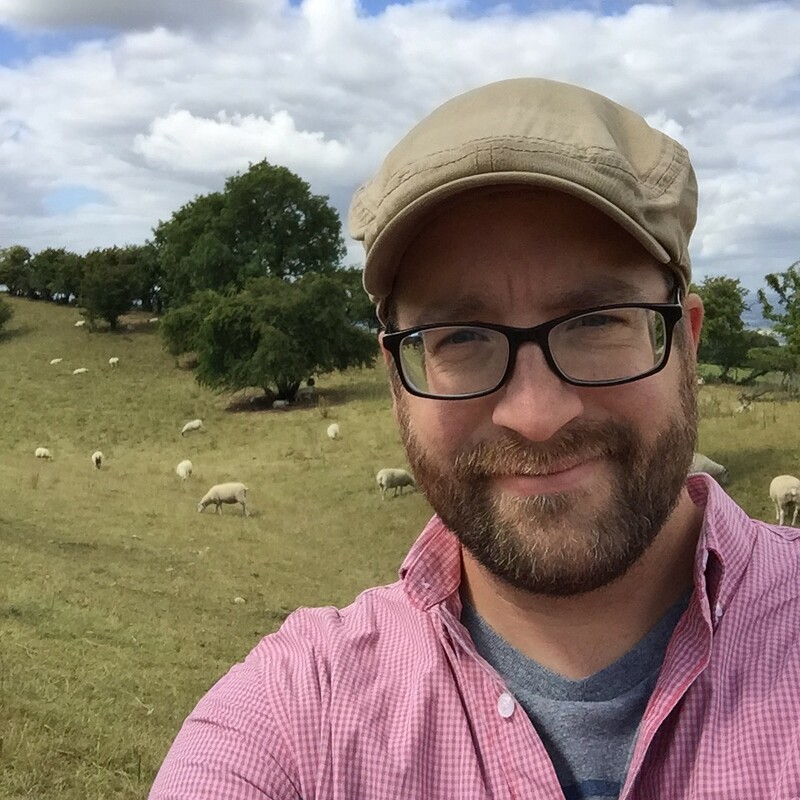 No–actually, I did (what economic downturn? ), but it was a tasteful temple. Not boxy, but lots of curves and soft colours. Dixie bought some boots. I bought a cast-iron teapot. After the Mall of America we got ready for the show, which started at 4:45. It’s broadcast live. The in-studio audience gets 15 minutes of extra music and talk. 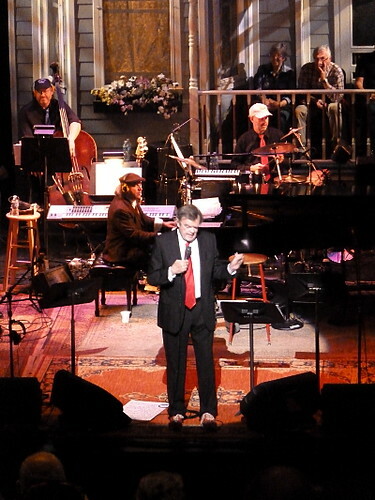 They play a couple of numbers, Garrison Keillor does a bit of talking–letting us know what is coming up in the show, a practice run of a song or two which we are to sing along with during the chorus. And then the broadcast show begins. Some more pictures here. We discovered on our arrival that the camera had unfortunately been on for who knows how long and our battery was nearly dead. So we were unable to take many pictures. We waited for Garrison afterwards. He did eventually come out, but it seems that he had to get to the opera, where his wife plays in the orchestra. I’m pretty sure he deliberately avoided eye-contact with his fans (with, I am sure, feelings of deep regret). Click here to listen to the archive of the broadcast we attended. Listen on some quiet evening at home. Get a cup of coffee or tea, dim the lights, sit in a comfortable chair and put your feet up or lay on the couch, and take in the warm, down-home sounds of A Prairie Home Companion. The show really was wonderful. I’m glad we went. I will say quite honestly, though, that being in the live audience is not much different than sitting at home and listening on the radio/internet. The show really is directed at the radio audience (contrary to what I told Andrew)–Garrison wanders around, technical people walk onto stage with papers for Garrison to read, Garrison gestures to offstage people during songs, etc. It was really an interesting experience, but not ultimately that different than the at-home experience. This is, I suppose, just as it should be. And you know what? I’d go back in a second. Afterwards we walked to the St. Paul Grill, where we had an extravagant and delicious supper. It’s the kind of place where you have to order all your side dishes separately, otherwise you’ll end up with a steak on an otherwise empty plate. Dixie tells me the technical term for this is “a la carte”. The tip for that meal was the same amount as the entire cost of that morning’s breakfast (including tip) at Mickey’s. As a bonus, I accidentally spilled half of my glass of wine on the floor and some of it splashed into the purse belonging to the lady at the table next to ours. Then they replaced that glass with a full one at no charge (a benefit of a hoity-toity restaurant?). And THEN Wallace Shawn walked by. That’s right–the “Inconceivable!” guy from The Princess Bride! He’s actually a respected stage actor, but I thought it would be funny to walk up to him and praise him for obscure and non-artsy work he’s done. “I loved your voice-over work in The Incredibles!” or “I always thought the strongest episodes of The Cosby Show were the ones with you in them.” Of course, I didn’t say anything to him. Because I’m intimidated by even M-list celebrities. And he was wearing intimidating artsy-fartsy clothing: black pants and shoes; a black turtleneck cotton shirt. The next day we drove to the Cathedral Hill area, where Garrison Keillor lives. We didn’t find (or, in fact, look for) his house. However, he is the proprietor of an independent bookstore–Common Good Books–and we went there. Cathedral Hill is a beautiful area of St. Paul, filled with Victorian homes and coffee shops and Mr. Keillor’s excellent bookshop. It’s got the largest poetry section I’ve ever seen in a bookstore–it was easily 4 or 5 times the size of any other section there. And his own books? They’re tucked away, way back in a little out-of-the-way nook with the travel literature. We spent more than an hour there. Bought some books. Afterwards, we checked out of our hotel and had lunch at an Italian bistro down the block. I order an Italian beer to wash down my slice of pizza. AND I WAS I.D.ed! First time. Unbelievable, with this beard. I’m a grizzly bear. Then we went to Target. Basically Zellers with a different name. They won’t have much work to do when they convert Zellers in Canada. And then we went home, this time by way of the 59/10. It was just as fast. This entry was posted in Arts & Entertainment, Travels and tagged A Prairie Home Companion, Garrison Keillor, Minnesota, St. Paul, Travels on September 30, 2011 by Marc. So I’m making up for that error here. His episodes on the Cosby Show really were the best, weren’t they? This morning I was reading out of “Life Among the Lutherans”, a collection of Keillor’s Lake Wobegon stories. I was doing my Garrison Keillor impression as I read. Then Dixie asked me to read it like Stuart McLean. Hilarity ensued. You two are something else! I’m a little relieved to say that I don’t have a *clue* what any of you are talking about. Oh what a wonderful experience! I am so jealous! Garrison Keillor was a constant companion when I was on the road. I’m still getting the podcast feed but haven’t listened to them for a while. I shall listen to the recording you attended later in an evening, with a good cup of tea, the lights turned low and a light rain drowning out all other distractions, sitting comfortably on a couch (just as soon as it arrives). I first became aware of Garrison Keillor by stumbling across his book Lake Wobegon Days, and went on to devour most of his books. I later became aware of A Prairie Home Companion, and though I’m not a regular listener, I make a point of dropping by the website for a listen occasionally I have the movie on DVD, and also the DVD of the 30th broadcast season celebration. Droll stuff. I also like The Vinyl Cafe. I like Vinyl Cafe, too. But it’s no APHC. I generally enjoy Garisson’s storytelling style more. McLean’s stories are good, too, but I find his delivery to be a bit harsh. That said, I think McLean is more consistent in telling a complete story with a beginning, middle, and end. The impression I get with some of Keillor’s News from Lake Wobegon is that he makes it up last minute and it sort of rambles. Still engaging, but sometimes I wish for more substance. But then he writes pretty much the entire 2-hour show every week, so what can I expect?